Surfers Paradise Baseball Club fields three senior teams each summer season in the top league of Queensland: the Greater Brisbane League (GBL). The season runs from September to March, with sign-ons starting in early August. New players are most welcome. To enquire further, please send a message through our Contact page. For all GBL Seniors team and individual stats, including historical records for Major A, please go to the Stats section. Surfers Division 1 2017/18 champions – Winners are grinners!! The Surfers Paradise Baseball Club entered the Greater Brisbane Major League in the 2002/03 summer season and promptly stamped their mark as one of the top clubs in the league. After making the grand final in their first season, the major A grade team came back strong in the 2003/04 season to take out the premiership over Windsor. Since then, the major A grade has always been in the hunt, making the post-season finals nearly every year. 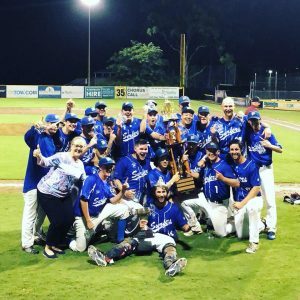 The team took out last years 2017/18 Division 1 Queensland Major Baseball League Premiership for the 6th time, defeating the heavy-hitting Windsor Royals 2 games to 1 in the best of three series to cap off a great season. With experienced veterans and promising young guns, the Surfers Paradise Bluewave are a formidable force to be reckoned with.